all the ingredients, just waiting for the milk. Maximilian Bircher-Benner is the man we have to thank for this wonderful, Swiss version of Muesli. Bircher muesli is a raw meal consisting of oats, nuts and fruits. It was an accidental experiment from Bicher himself. As he finished medical school and opened a general health clinic in Zurich in the late 1800’s, he became ill with jaundice. It’s been noted and documented that Maximilian healed himself solely through eating apples. Bircher was aware of the fact that food had healing benefits, while more than likely, the medical community surrounding him did not. He then made the connection with improved health from eating raw. He stated that raw fruits and vegetables were the healthiest out there for the human body. While he noted in the late 1800’s that meat had the least amount of healthy elements for the human body. Of course, today, this is nothing new. But in the late 1800’s, it was monumental. But, surprisingly, many took to his philosophy of eating raw and vegetarian. In 1897, Bircher opened all the nutritional clinic, “Vital Force” and was a huge success. You can read his book titled, “Food Science for All” if you’d like to encompass more about his philosophies. As I mentioned above, “muesli” is a wonderful Swiss breakfast, or anytime dish. Consisting of oats, fruit, nuts and in my version, milk it really is the perfect proportion of food and nutrition. Bircher himself stated that he felt muesli “corresponds with the laws of the human organism,” its composition, i.e., its proportions of protein, fat and carbohydrate calories, being identical with mother’s milk. There’s nothing complicated about this recipe. Use your fruit, cut it up, add your oats, nuts and raw milk. Mix it up, put it in a cold place (fridge) and eat it when you desire. My adaptation is a bit different from his original, but not much. I have provided his original ‘clinic recipe’, and below is my adaptation. Either way, share it with the ones you love and enjoy! 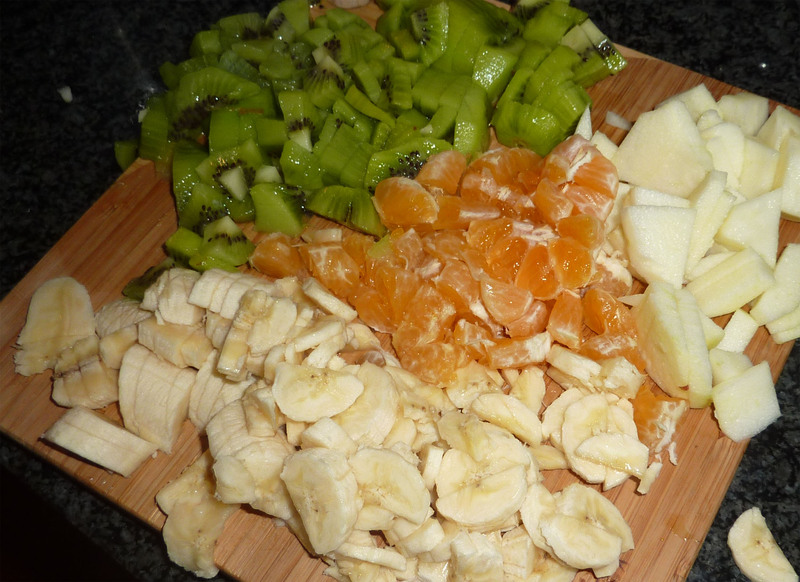 cut the fruit up in small pieces, nice and fine. Don’t peel the skin, keep as much nutrient rich skin on as possible. I choose to work with blood oranges, apples, bananas and pears. serve after sitting in the fridge for about an hour.